Constructed with a 30.50" 1050 high carbon steel blade and a 5.75" wood handle. Comes complete with a leather/wood scabbard. absolutely beautiful. i got this for my brother for his birthday and when it arrived, i considered keeping it!! but i already told him i got it for him... =( its solid, sharp, flexible, and strong. the best shamshir you can get for the money. I didn't understand why TrueSwords took so long to ship this sword. I waited 6 days before this sword got here. Before when I ordered from the site, it took about 2-3 days for anything to get to my house. More on to the sword. The sword is nice in look. The sword's edge has a 2nd beveled edge, like a knifes edge, but is still extremely sharp. I believe the manufacture, Cold Steel, did this because the sword is self is not historically thick. So maybe in the past these type of swords, their edges would go bad very quickly if it had a convex edge. So Cold Steel added the 2nd beveled edge, to make the blade more sturdy and probably allow the cutting edge to last longer. The handle is made of some sort of hard plastic/resin. 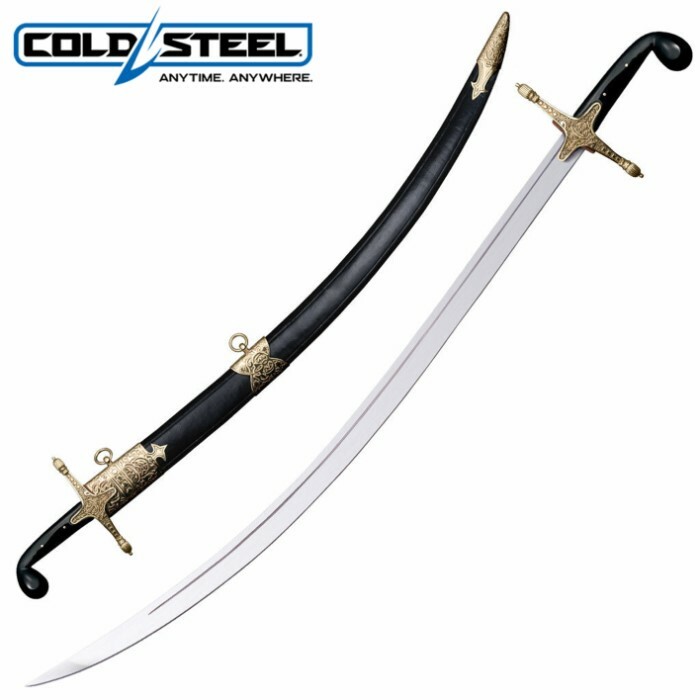 Like all Cold Steel sword's, they take historically sword, and modernize them by a tad bit to give them a interesting, and yet, unique look. 3 Star's for the shipping guys. Overall your product that you sold to me was very nice. This Persian/Arab style sword is pretty impressive. It gives me the urge to acquire some robes and a headdress like Lawrence of Arabia or Omar Sharif (but not a camel). The design and construction are A#1 in my book. The only suggestion for improvement is the blade edge could have come more uniformly sharpened. The shamshir would look good on the den wall crossed with a crusader-type blade, such as the CS hand-and-a-half sword...."East meets West." This is my first purchase from Trueswords. Their cost is easily the cheapest I have seen for this sword. The sword itself is very sharp, beautiful to the eye and handles like a dream. I am very pleased with this purchase and will make more in the future.